TechCrunch published a post recently, the premise of which was SoundCloud’s recent tapdance with major labels. The post discussed SoundCloud’s $35M in debt funding, and newly signed deal with Universal Music Group. The fact that the aforementioned funding was actually finalized last May notwithstanding, the piece concluded that the upshot of the whole situation is that SC would end up being worth more than rival Spotify. Here’s why that’s not exactly the case. While the TC piece makes some astute points, its most important argument—that SoundCloud has the opportunity to become the YouTube of audio—doesn’t exactly stand on its own. SoundCloud has a major issue in that it’s caught in between two completely different paradigms—that of the independent and that of the major label—and doesn’t seem to know how to resolve those differences. Up until now, the ill-fated balancing act it’s been trying has been somewhat workable, but going forward it will be tenuous at best. As such, the real story here is how SoundCloud is evolving, and not in a way that is wonderful for the independent artists who have historically been its core constituency. 1) It resolves (at least for the moment) the issues which the music service is having with some of the labels over licensing and royalties. The new deal with Universal clearly comes with it an agreement that the label will drop any pending legal action against the service, as music will now be licensed directly to SC. (It does, however, do nothing for the mass of pending litigation between Sony and SoundCloud, as the former is that last major label holdout to strike a deal with the service). 2) It effectively continues the alienation of the independents upon which the service has historically built its core and more loyal following. To be clear, there’s nothing wrong with serving the mainstream. However, most every one of the major music companies already does that, leading to an already crowded crawlspace of competitors vying for mainstream supremacy. While the major music companies set their collective focus on mainstream material, the independent demographic is left languishing in the wind time after time. Initially, SoundCloud was an exception in this respect, cutting its teeth in the independent arena long before it signed deals with any of the major labels (starting with Warner Music Group last year). Since then, however, SC has been moving further and further away from the paradigm from whence it rose and closer towards the crowded party at the mainstream table. While SC battled other services for mainstream consumers, it had for a while been the favorite among independents and underground artists looking to cultivate their fanbases from the ground up. Even Alex Moazed in his guest TC piece acknowledged that this is what makes SC win: the fact that this is where the content stream starts for a lot of new artists (a rapidly growing demographic) and where they begin to build their initial fanbases and cultivate their followings. That SoundCloud is not only moving away from that, but seemingly shunning it in the long run, is a palpable kick in the face for a lot of independents. 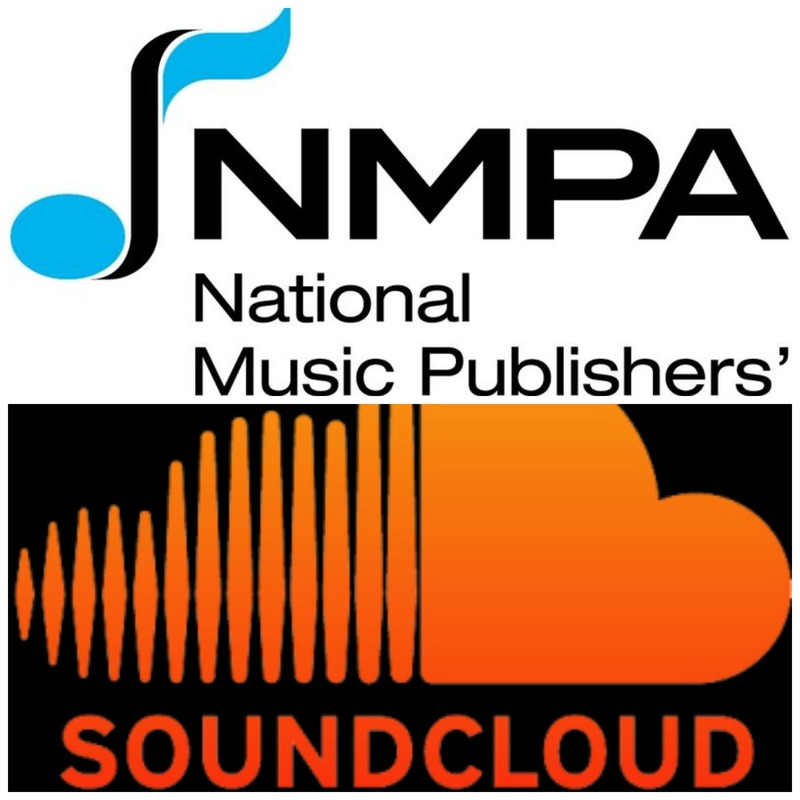 What Moazed doesn’t address in his piece is exactly what I discussed last spring: why independent artists should essentially kiss SoundCloud goodbye, why their subsequent deal with the NMPA was irrelevant for independents, and ultimately why the precarious high-wire balancing act was leading them down a difficult path. Independent artists, unlike major label performers, are not locked into any required loyalty as a result of record label contracts. They can come and go as they please on any variety of services, and thus are free to explore any new ( and better) opportunities that might arise. SoundCloud’s error in judgement here is assuming that the independent demographic (arguably its only real unique demographic of content producers) will stick around when the winds change, and the focus of the platform shifts to mainstream desires. Already there were grumblings in the independent underground when SC premiered its new layout early last year. The simple reality is that SoundCloud fundamentally cannot serve two masters (the independents and the major labels) because each is moving in an opposite direction, with desires and mentalities divergent of one another. 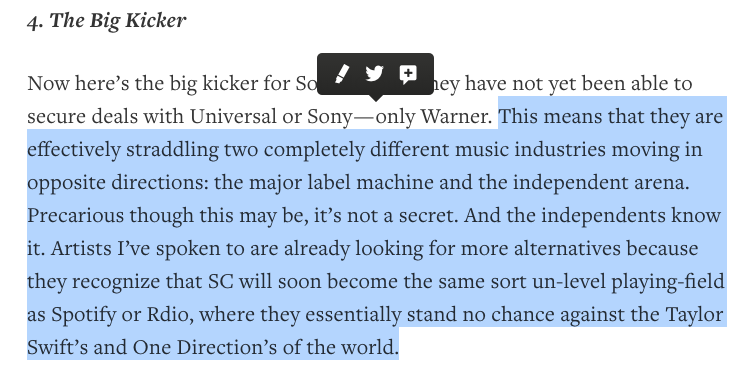 Now, with the Universal deal, I see only one way SC can continue to struggle towards profitability, and that is in the major label direction. That, however, presents another can of worms. As some have already pointed out (or could simply guess), the Universal deal could not have been cheap by any means, particularly as it meant Universal dropping its legal action against the music service. Furthermore, as Warner gained around a 5% stake of the company when it licensed its own catalogue, one can calculate that Universal settled for nothing less than a similar deal (likely pushing for more equity in order to drop the legal suit). That’s a huge premium to pay for Universal’s recording and publishing catalogues, and doesn’t yet take into account all the royalties SC will now have to cough up on the backend. The real hard hitting numbers come when one imagines what Sony, the last major holdout, will demand for its material. 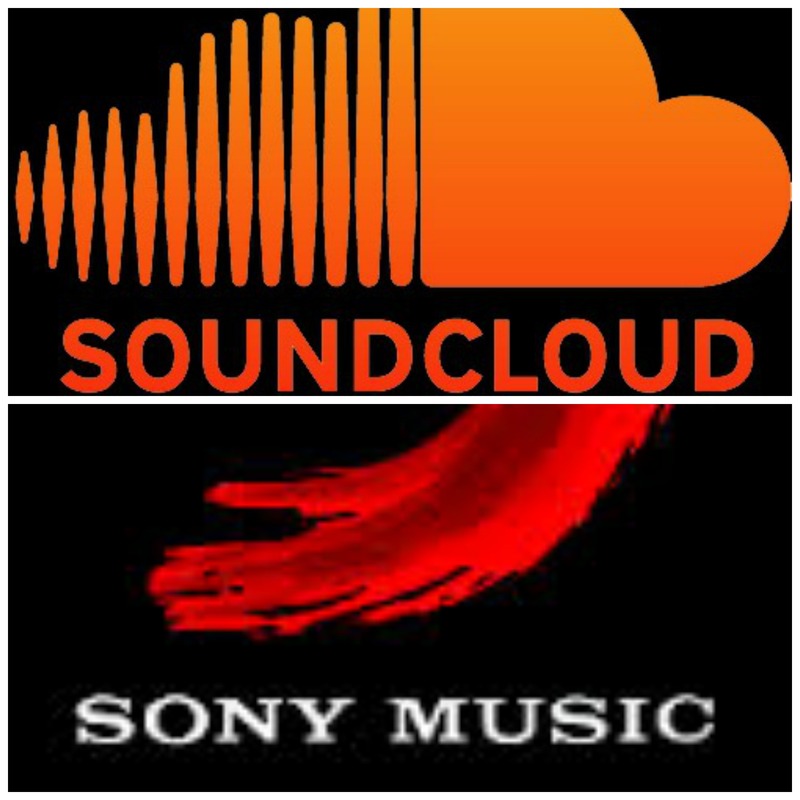 Seeing as it currently has legal qualms with SoundCloud, it’s conceivable that Sony could demand even more cash upfront and equity in order for access to its musical coffers. 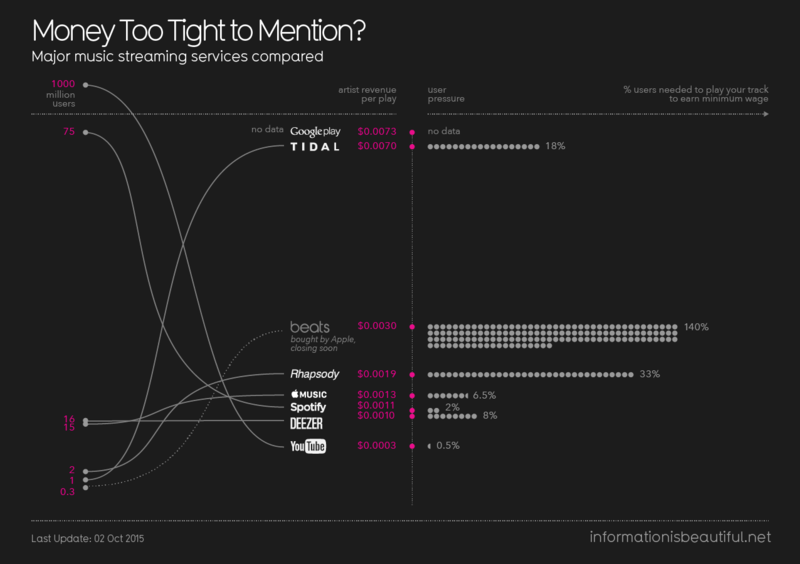 At a minimum, one could calculate the collective equity of the major labels to total somewhere around 15%—at a minimum. 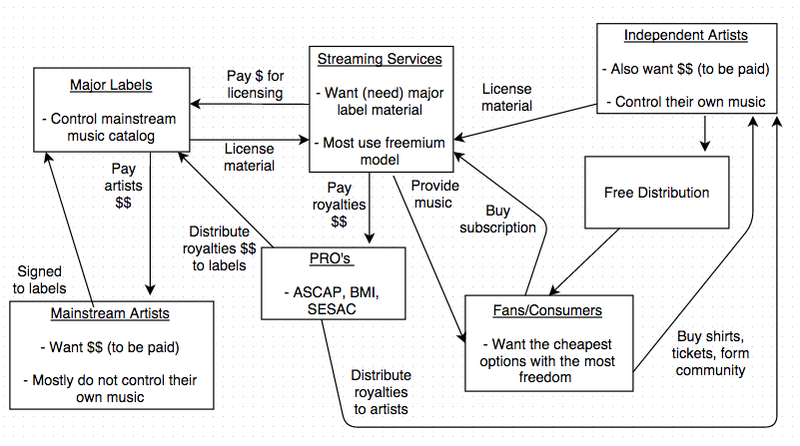 Though not listed specifically, the chart below gives one a good idea of where SoundCloud will inevitably fit within the royalty paradigm, and just how much friction it will cause between both the service and artists, and the service and the labels. Two different (divergent) interests make for a massive headache in the long term for SoundCloud. This may seem like a paltry price of doing business until one considers the fact that the relationship dynamic is not an equal one: the major labels hold the keys to the material which SoundCloud wants (and desperately needs, in order to win the mainstream game), but are not equally in need of SoundCloud itself. They similarly license the same material to a variety of competing music services, and essentially can dole it out to the highest bidder, through contracts which then become renegotiable every few years. Thus, SoundCloud (and others) are beholden to the major labels for their lifeblood, but the opposite is not true. SoundCloud has entered into a paradigm that’s nearly impossible to backtrack from. They’re tying their own concrete shoes. All of this firmly underscores the uncomfortable news recently that SoundCloud took a $44M hit in 2014, making their raise of the above-mentioned $35M almost irrelevant. That the raise of the $35M in debt financing will essentially have to go to cover SC’s 2014 losses must be a bitter pill for investors to swallow, particularly as much of their customer base uses the service for free. 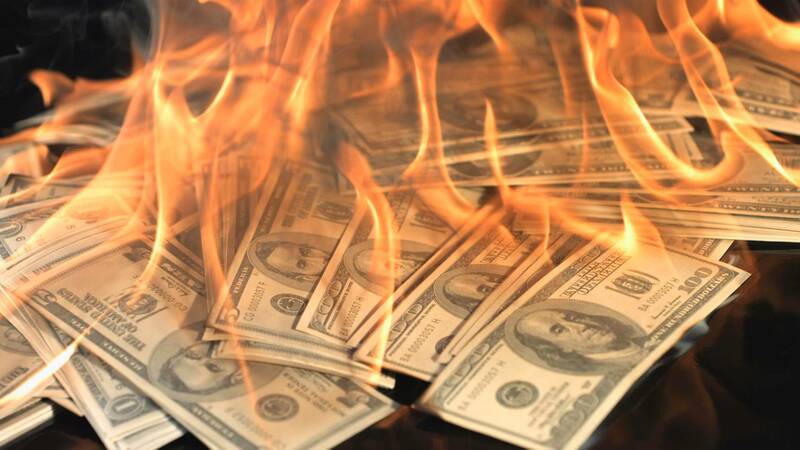 The simple truth, as it appears to be, is that SoundCloud is hemorrhaging money with no clear path to take to fix things, either quickly, or in the long term. That being the case, it’s fairly probable that SoundCloud will need to start raising another round of money somewhat soon, even if it’s just to weather its current storm. These comments highlight the discussion going on regarding SoundCloud not only among its general consumers, but among the artists who create the content on which the service was built. It’s important to remember that before SC had any major label deals in place, it was doing quite well because of the huge influx of independent material coming in from independent artists and DJ’s. In moving further and further away from this core demographic, SoundCloud is quite aggressively biting the hand that feeds it. SoundCloud’s response to the Reddit thread was equally underwhelming and unpersuasive. The loyalty of such independent artists is a complex thing; on the one hand, they aren’t tied to any one particular party, and thus their loyalty to any one service may be thought of as ephemeral. On the other hand, however, their loyalty has the potential to be ferocious and dogged if and when they find a service which works for them, in their favor. 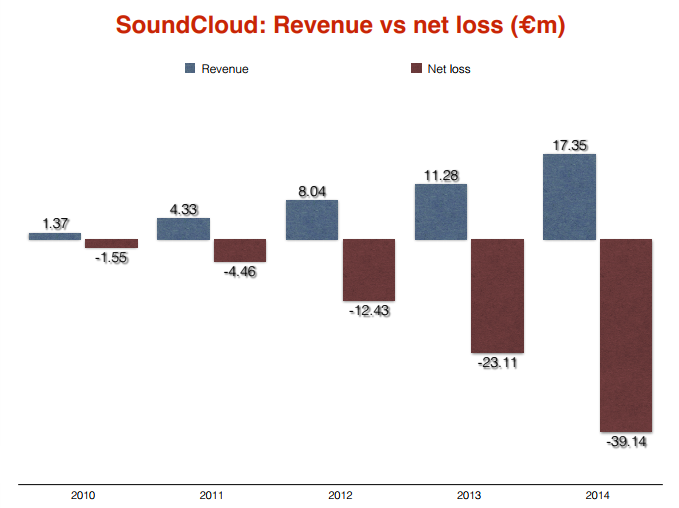 SoundCloud used to be that service, but it isn’t any longer. They’ve traded the long term loyalty of these smaller—but much more numerous—independent artists for the short term benefit of being able to peddle major label mainstream material. The same exact mainstream material which all their major competitors are already selling. They’ve traded the long term benefit of being unique for the short term “benefit” of being just like everyone else. The big kicker though, is that SoundCloud didn’t start as Spotify of Apple Music did, with deals with the major labels. It doesn’t come from that part of town. 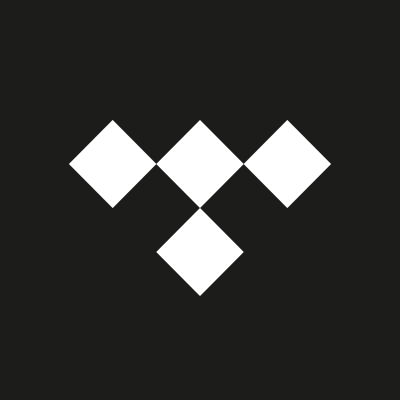 It comes from the less expensive, more experimental street of independent artists, covers, and remixes. It blew up among independents long before mainstream listeners got wind of it, and now it’s moving away from those early adopters towards a more corporate clientele. As far as I can see it, this is incredibly ironic: the independent music universe is just now starting to mature and expand rapidly, while the major label world is getting cramped and hideously expensive. 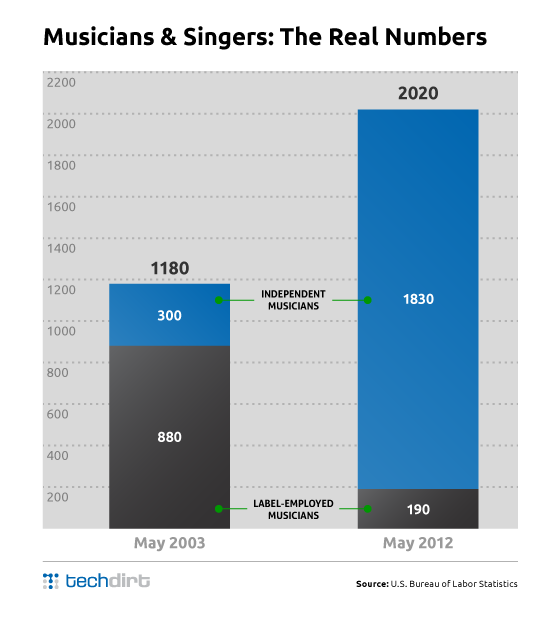 Over the last decade, independent music has grown immensely while major label-signed content has actually decreased. Put simply, the number of expensive, mainstream artists which big music companies are fighting over is shrinking while the number of free and/or inexpensive independent artists is actually growing at an almost exponential rate. Insofar as the independent universe might not be as lucrative as the mainstream arena in the short term, it nonetheless is where the most growth is happening. So where does all of this leave SoundCloud? In the short term, the Universal deal is a great breakthrough, and certainly will help them more aptly compete with Spotify and Apple. However, it’s clearly been overshadowed over the last few weeks by their financial woes and discussions of possible paths forward. In the long term, though, they will end up dismissing the demographic and core base that made them special to begin with. Someone else will pick up that gauntlet and run with it, and that’s where the growing independent base will go.